QUESNEL, JULES-MAURICE (baptized Julien-Maurice), fur trader, militia officer, businessman, office holder, jp, and politician; b. 25 Oct. 1786 in Montreal, fourth child and second son of Joseph Quesnel* and Marie-Josephte Deslandes; d. there 20 May 1842. 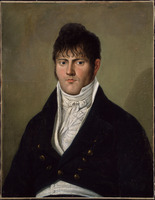 The son of a cultivated merchant, Jules-Maurice Quesnel, like his older brother, Frédéric-Auguste*, was educated by the Sulpicians at the Collège Saint-Raphaël in Montreal, but he was a student there for only two years (1797–99). By 1804 he was a clerk for the North West Company at Fort des Prairies, or Fort Augustus (Edmonton). In the winter of 1805, as an assistant to David Thompson*, he freighted goods into the Rocky Mountains in preparation for an expedition westward. He was at Rocky Mountain House (Alta) in October 1806 and the following month conducted an exploratory expedition into the mountains. In the late summer of 1807 he was sent to New Caledonia (B.C.) 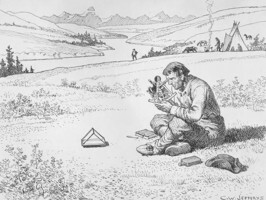 with supplies and instructions for Simon Fraser* to follow the Columbia River to its mouth. He accompanied Fraser on his perilous voyage in 1808 down what turned out to be the Fraser River, not the Columbia, and back. The first major tributary they reached was named the Quesnel; later the lake it drains and the town which developed at the confluence of the Fraser and Quesnel rivers would be named for him as well. In the summer of 1811 Quesnel left the NWC and returned east. He was commissioned an ensign in Montreal’s 2nd Militia Battalion on 2 April 1812 and promoted lieutenant on 14 July. He may have fought in the War of 1812, but if so he did not let his participation interfere with the development of his commercial interests. By 1813 he was resident in Kingston, Upper Canada, and engaged in trade there, and by 1814 he had settled in York (Toronto), where he was warned by his brother about the dangers of speculating in rum on his own account. From 1815 until 1818 Quesnel spent time in both York and Montreal, but after his marriage to Josette Cotté on 10 June 1816, in Montreal, he apparently wanted to settle in that town, and by 1818 he seems to have done so. His wife was a daughter of the late fur-trade merchant Gabriel Cotté* and a sister-in-law of former fur trader François-Antoine La Rocque*; the couple probably did not have children. 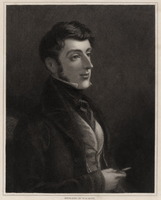 In the spring of 1815 Quesnel and John Spread Baldwin, a brother of William Warren, had joined in partnership with Laurent Quetton* St George, by whose firm, Quetton St George and Company, Quesnel had previously been employed. St George left that year for his native France and did not return until 1819, leaving the business in the hands of Quesnel and Baldwin. Quetton St George and Company was a small firm by Montreal standards though substantial for Upper Canada. In Montreal, Quesnel purchased wholesale from the city’s importers a wide array of foodstuffs, drinks, and merchandise; as well he sold Upper Canadian produce, particularly flour and potash, on behalf of a store in York operated by Baldwin and another in Niagara (Niagara-on-the-Lake). The extension of credit was a necessary operation, and by 1819 the firm was owed £18,000–£19,000, largely by farmers, a sum greater than its net worth. In May 1820 Quesnel and Baldwin bought out St George for four annual payments of £1,000 plus interest at six per cent. Baldwin tried to assert primacy and at one point backed out of the new partnership. He soon conceded, however, and the reorganized firm was known as Quesnel and Baldwin. It carried on the wide variety of commercial and financial activities conducted by its predecessor, possibly dealing at times direct with British firms and adding timber to its exports. The economic context was difficult, and in August 1821 Quesnel was elected to an 11-man committee of Montreal merchants which was to press the British government to admit Upper and Lower Canadian grain and flour without restriction into the British market. Flour was the firm’s main export, but fluctuating prices on the English market frequently caused the company losses; the mark-up on imports provided more reliable profits. Quesnel and Baldwin prospered enough to allow the partners to pay debts amounting to several thousand pounds by 1825. However, the firm showed little growth, the volume of trade remaining relatively constant; for example the company appears to have shipped regularly 1,000–1,500 barrels of flour and 75–125 barrels of ashes per annum to Montreal. In April 1825 its net worth was £15,200, of which £10,642 was in debts, and in 1832 that worth was evaluated at only £19,134, including £9,215 in debts. From 1820 to 1832 the company provided Quesnel with an average income of £693 a year. Quesnel and Baldwin also engaged in ancillary activities. Both partners were shareholders in the Company of Proprietors of the Lachine Canal and in the Bank of Upper Canada. They declined having an agency for the Bank of Canada, however, because Baldwin feared the bank would harm their reputation. The firm owned a share in a steamboat on the Kingston–York route and took a one-tenth share in a 120-ton steamboat launched at York in 1825 for the York–Queenston run. The partnership agreement forming Quesnel and Baldwin expired in 1832 and was not renewed. Quesnel seems to have retired from active business and lived comfortably thenceforth as a rentier. He was, however, involved in the operations of the port of Montreal and concerned with navigation on the St Lawrence. From 1830 to 1839 he was a warden of Trinity House, Montreal, a government-appointed body which controlled pilots, pilotage fees, lighthouses, and navigation markings on the river; in 1839 he became deputy master, and he served until 1842. At the same time, from 1830 to 1836 he was on the harbour commission with George Moffatt*, a sometime business associate, during a period when merchants were pushing for greater expenditures on port improvements; several Canadian merchants served on that body in the 1830s and 1840s. 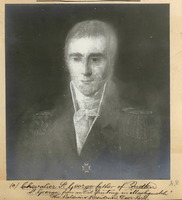 In 1832 he lobbied his brother Frédéric-Auguste, who was a member of the House of Assembly, on behalf of St Lawrence steamboat operators and Montreal merchants. 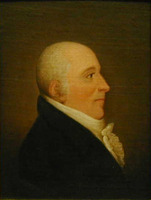 Four years later he succeeded George Auldjo as chairman of the Montreal Committee of Trade; Austin Cuvillier replaced him in 1837. In the 1830s promotion of port development meant taking a stand on some of the great political issues of the day, and Quesnel’s sympathies lay primarily with the English party, of which the Montreal merchant community was a major element. 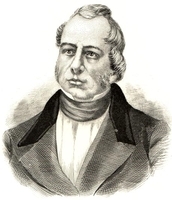 Early in his term on the harbour commission Quesnel had briefly resigned in protest against the assembly’s refusal to vote money for port improvements, believing that his presence on the commission was among the reasons inciting the Patriote majority to deny funding. As the positions of the English and Patriote parties grew more polarized in the early 1830s, Quesnel joined concerned merchants, British and Canadian, including Cuvillier, Joseph Masson, and Horatio Gates*, in calling for retention of the constitutional status quo. 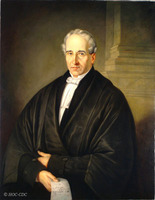 Having been appointed a justice of the peace in 1830, he was among a number of Canadian magistrates, including Pierre de Rastel de Rocheblave, Louis Guy, and Pierre-Édouard Leclère*, who in November 1837 warned the Canadians that those “who push you to excess” would abandon them and that they should follow those “who call you to peace.” In January 1838 along with Cuvillier, Rastel de Rocheblave, and other moderates, he formed the Association Loyale Canadienne du District de Montréal to oppose the resort to arms. His appointment to the Special Council in April 1838 and his reappointment in November for the life of that body indicate his standing with the government, and his willingness to serve is eloquent testimony to his views. He, seigneur James Cuthbert, and John Neilson were the only members to vote against the union of the Canadas, pressed on the council by Governor Lord Sydenham [Thomson]; however, in accepting an appointment to the Legislative Council in 1841, he indicated his reconciliation to union and his pro-imperial sentiments. Since his return to Montreal Quesnel had accumulated various honours and appointments. He had been promoted captain in the 2nd Battalion of militia in 1825, and he remained willing to serve until at least 1830. A warden of the House of Industry in 1829, he was appointed a commissioner for the relief of destitute emigrants in 1835 and a commissioner of foundlings and indigent sick in 1841. 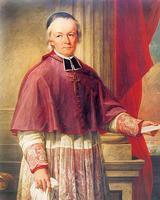 He accepted an appointment from Bishop Jean-Jacques Lartigue in 1838 to act as a lay administrator of the revenues of the Association for the Propagation of the Faith. 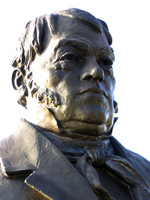 He was an appointed city councillor from 1840 until his death in 1842. His burial in the parish church of Notre-Dame was witnessed by his old friend La Rocque and by judge Jean-Roch Rolland*. Jules-Maurice Quesnel’s business activities paralleled those of many of his Scottish merchant contemporaries and, like them, he developed an attachment to the British empire and its institutions. It was clear to him and to Canadian colleagues that the imperial connection was essential to their prosperity. He therefore rejected as political folly the radical notions of petit bourgeois Patriote leaders as he did the more extreme political proposals of British tory merchants. The author wishes to thank Paulette M. Chiasson of the DBC/DCB for her assistance. ANQ-M, CE1-51, 25 oct. 1786, 10 juin 1816, 23 mai 1842. ANQ-Q, P-222. BVM-G, Fonds Jules Quesnel. PAC, MG 19, A12, 4; A16; MG 24, L3: 10792, 11009–13; MG 30, D1, 31: 358; MG 55/24, no.152; RG 68, General index, 1651–1841; 1841–67. Les bourgeois de la Compagnie du Nord-Ouest (Masson), 1: 397. Simon Fraser, The letters and journals of Simon Fraser, 1806–1808, ed. W. K. Lamb (Toronto, 1960). New light on the early history of the greater northwest: the manuscript journals of Alexander Henry . . . and of David Thompson . . . , ed. Elliott Coues (3v., New York, 1897; repr. 3v. in 2, Minneapolis, Minn., ). David Thompson, David Thompson’s narrative of his explorations in western America, 1784–1812, ed. J. B. Tyrrell (Toronto, 1916): xlix. Quebec Gazette, 27 Aug. 1821, 4 Sept. 1823. William Notman and [J.] F. Taylor, Portraits of British Americans, with biographical sketches (3v., Montreal, 1865–68). Turcotte, Le Conseil législatif. Chaussé, Jean-Jacques Lartigue, 219. E. A. Collard, The Montreal Board of Trade, 1822–1972: a story ([Montreal], 1972), 53. Robert Rumilly, La Compagnie du Nord-Ouest, une épopée montréalaise (2v., Montréal, 1980); Hist. de Montréal, 2: 192; Papineau et son temps. J.-J. Lefebvre, “Les députés de Chambly, 1792–1967,” BRH, 70 (1968): 3–20. É.-Z. Massicotte, “La famille du poète Quesnel,” BRH, 23 (1917): 339–42. Peter Deslauriers, “QUESNEL, JULES-MAURICE,” in Dictionary of Canadian Biography, vol. 7, University of Toronto/Université Laval, 2003–, accessed April 24, 2019, http://www.biographi.ca/en/bio/quesnel_jules_maurice_7E.html.